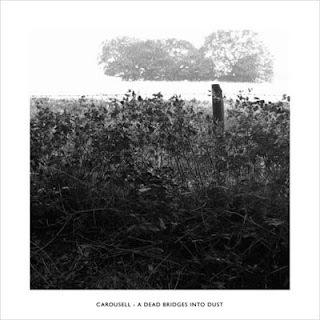 By turns lullingly ruminative and plangently affecting, Carousell is one of the assorted aliases under which Britain's Richard Skelton (who also trades under A Broken Consort And Heidika) lovingly teases out subtle and variously gradated shadings of string scrape drone motion and for my money, it's his most wholly satisfying. Carousell's luxuriant sonics may reflect the most conventionally pretty manifestation of Skelton's immersive muse, but there's still plenty of understated experimental heft to this particular alloy, Skelton here recasting his long-form drones and sweetly chiming acoustic note cascades inside spectral and pregnantly suggestive soundworlds of an almost Ulver-ish cast. no track 4. Fat finger id3 editing I guess. New Carousell album finally out. Black Swallow & Other Songs. Check it.